For the very first time, researchers from China evaluate the phytotoxicity of cerium oxide nanoparticles (CeO2 NPs) in a plant agar medium. Plants: basic components of the ecosystem and vulnerable to nanoparticle exposure. It is important to understand the interactions between nanoparticles and plants, especially when herbivorous consumers introduce these plants into our food chain. As CeO2 NPs are widely used in many applications, their interactions with the ecosystem are inevitable. It has previously been shown that CeO2 NPs can inhibit root elongation of plants in aqueous suspensions. Dr Zhiyong Zhang et al investigated the toxicity of CeO2 NPs on asparagus lettuce in a plant agar medium, a semisolid, soil-like medium which provides a more realistic environment for plant growth. A variety of parameters were investigated to understand the plant’s defence and response to abiotic stress caused by CeO2 NPs. Although the agar medium limited the bioavailability of CeO2 NPs, they were still more toxic to asparagus lettuce in the agar medium than in aqueous solution. This could be caused by the production of excess reactive oxygen species causing oxidative stress to the plants. 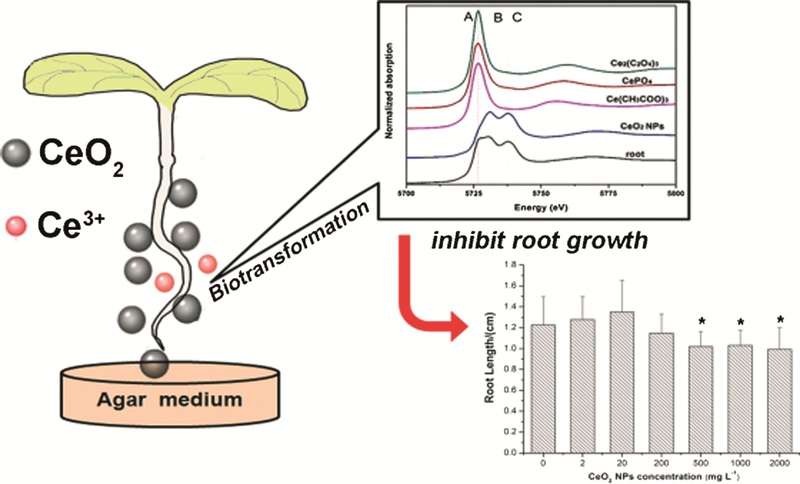 The increased phytotoxicity of CeO2 NPs in a soil like medium can also be explained by the biotransformation of CeO2 NPs. It has previously been demonstrated that Ce3+ released from CeO2 NPs can cause species-specific toxicity. This study showed that in an agar medium more than 20% of the Ce in the roots was transformed to Ce3+, whereas in aqueous solution only 6% of CeO2 was reduced to Ce3+. It is therefore reasonable to postulate that the phytotoxicity of CeO2 NPs is also attributed to the release of Ce3+. To read the full paper, download it for free* today!